Well now, Episode 3 was a happy episode, wasn’t it? Even the foreshadowing was happy. Daisy studying for her exams with Mr. Molesley helping her. Anna smiling like the Cheshire Cat. Even though the foreshadowing was fun, the actual episode was also happy and marvelous and lovely. WE HAD A WEDDING, FOR CRYING OUT LOUD!! And weddings are always wonderful. 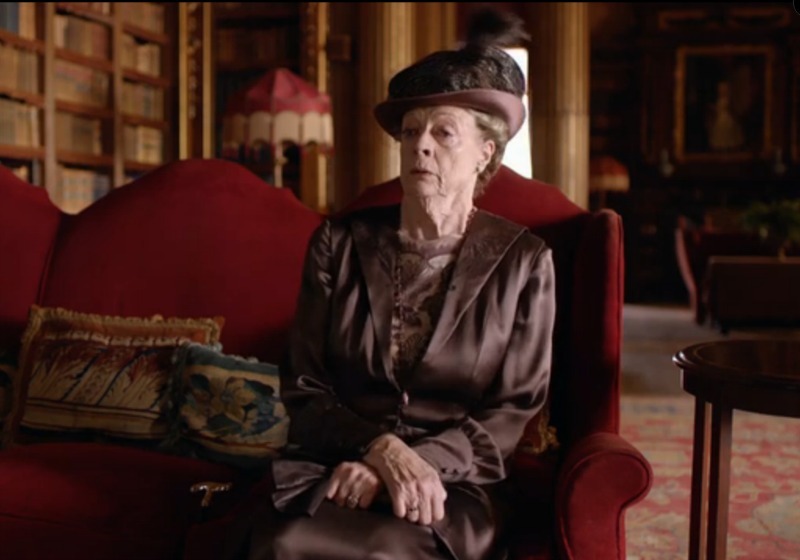 But at Downton, every wedding must come with a little drama. 1. And so we begin with wedding drama. 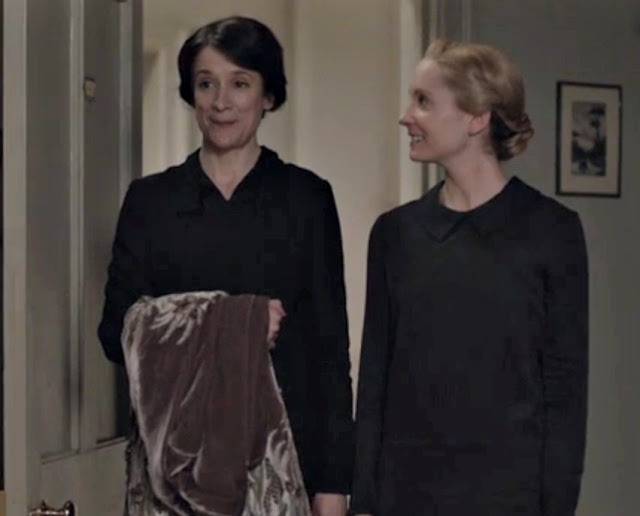 Mrs. Hughes and Mrs. Patmore head upstairs to the servants’ bedrooms where Mrs. Hughes is “showing off” her pathetic brown day dress that she chose to get married in. As they climb the stairs, Mrs. P. tries to get her BFF excited about the wedding, but Mrs. Hughes will have nothing of it. She’s still complaining about the reception being in the Big House. You know, I was at a party with some pretty posh people a couple of weeks ago and I didn’t see any nibbly bits caught in anybody’s teeth. I’ll have to be on the lookout for that in the future. 2. Violet always pleases, doesn’t she? This week was no exception since she gets two spots on my list. 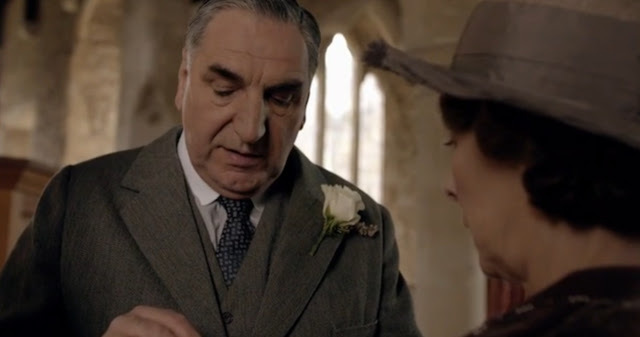 Her first great line came rather early on as she visits the Abbey to talk to Robert about this infernal hospital situation. 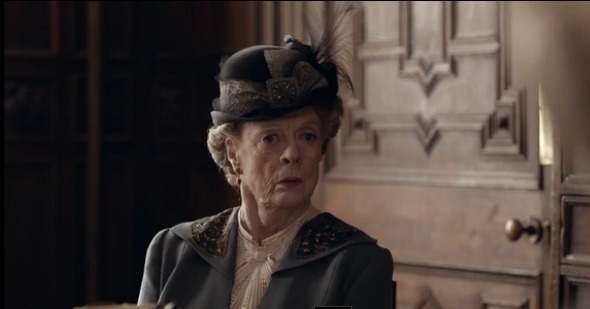 She’s worried that Robert is actually thinking about the merits of Isobel’s side of things. 3. And then there was the hospital meeting in Dr. Clarkson’s office. Isobel is in rare form up on that high horse of hers, insulting Dr. Clarkson about his soon-to-be-diminished authority around HER hospital. Everyone around the circle just sits there with their mouths hanging open. I don’t know why, but something about the way she asked that question had me laughing so hard. And Isobel didn’t even get the joke. 4. 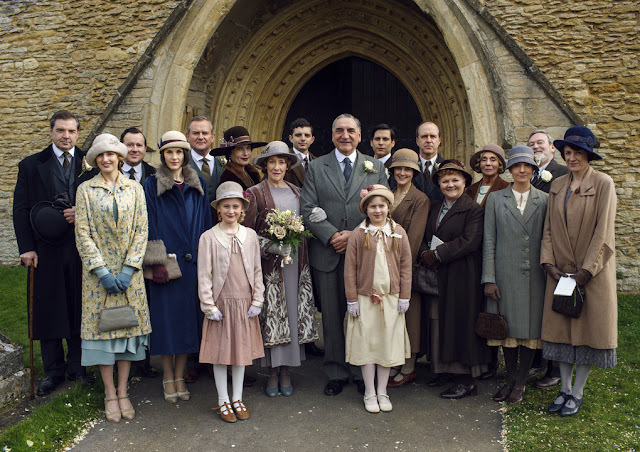 Now on to the good stuff—the wedding. So many great lines that I’ll have to pick just a few. First, how about when Baxter and Anna come in with that troublesome wedding jacket in their hands? And then there was the actual wedding ceremony itself. So simple. So understated. They didn’t even show much of the ceremony—I guess Carson and Hughes wanted to keep it private. But they did show Carson putting the ring on her finger while stating his vows, which I absolutely loved. “With this ring; I thee wed.
With my body, I thee worship. Why don’t we say vows like that anymore? They are so beautiful, so poetic. And they carry so much weight. And finally, how about that toast? Carson with just the right words again. The man knows how to make a statement, doesn’t he? 5. And then. The happiest surprise of them all (although, for the record, I called this one during the first episode)! Tom! I had to go back and watch this scene again just to capture the looks of surprise and joy on everyone’s faces. I’m sure mine looked just as thrilled. I’M SO GLAD TOM’S BACK!!!! And I’m pretty sure he’s back for good. And I’m pretty sure there will be another wedding down the road. And no I haven’t watched ahead. Oh yes you are, Grantham clan. You’re in it with the chauffeur forever it looks like to me. And thank goodness for that, amiright? Till next week. . . .
Facebook. Instagram. Twitter. I'm all over it, and you should be too. Won't you join me? Excellent post, as usual! And I have to say that I loved Carson & Mrs. Hughes' vows too - because those are the vows we used in our wedding! You're right, we don't hear that version very often.